Thanks again to Jac from Tinned Tomatoes for letting me guest host Pasta Please in June. 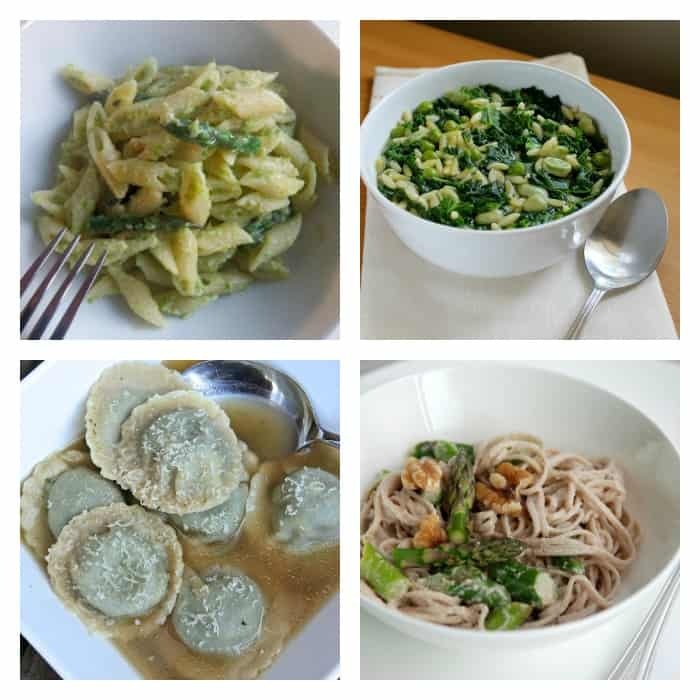 Thanks too of course to everyone who joined in and added their pasta recipes to the linky. All of the entries this month make the best of the fresh produce that abounds in the summer. I will definitely be trying them out very soon, and have bookmarked several already. I think the first will be the Veg Hog’s colourful pea shoot and baby leaf pesto with sundried tomatoes. Which would you try first? Penne with asparagus and ricotta from Leeks and Limoni looks so refreshing and light, perfect for summer. Green veggies minestrone from Jen’s Food is a great way to get your five a day. Gluten free spinach and cheese ravioli from The Gluten Free Alchemist – I certainly wouldn’t guess this pasta is gluten-free, and the filling sounds divine. Walnut miso soba noodles with asparagus from the Taste Space is a great way to serve asparagus, the flavours sound great. One-pot spicy sausage pasta from Charlotte’s Lively Kitchen would definitely be a hit in my house. Butter linguine with garlic mushrooms from Lemon and Lime Thyme looks so good, it is calling to me. 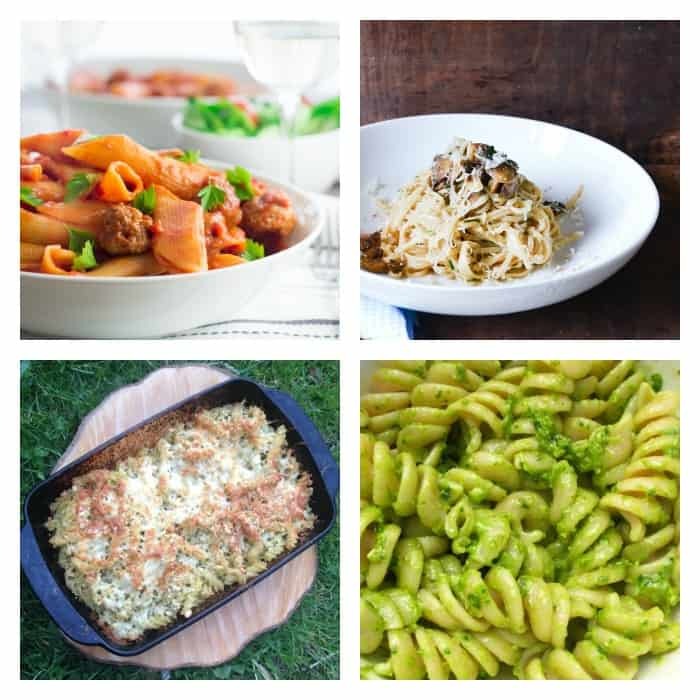 Pesto pasta bake from Munchies and Munchkins sounds delicious and a different way to me to use pesto. Pasta with fat hen and chickweed pesto from Tin and Thyme is made from edible weeds – definitely a tasty and economical recipe here! 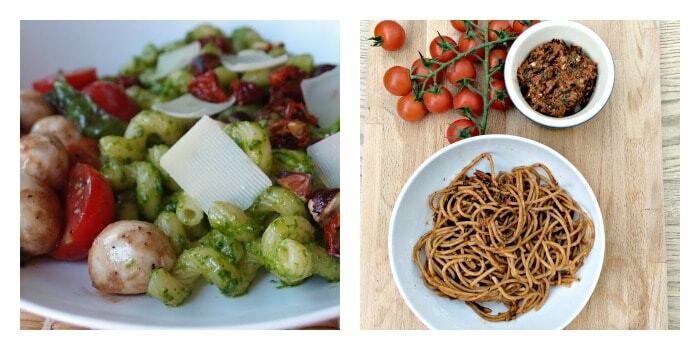 Pasta with pea shoot and baby leaf pesto and sundried tomatoes from the Veg Hog is so colourful and vibrant. It would certainly brighten up our dinner table! My red pepper and chard pesto on wholewheat spaghetti was simple to make with lots of flavour. 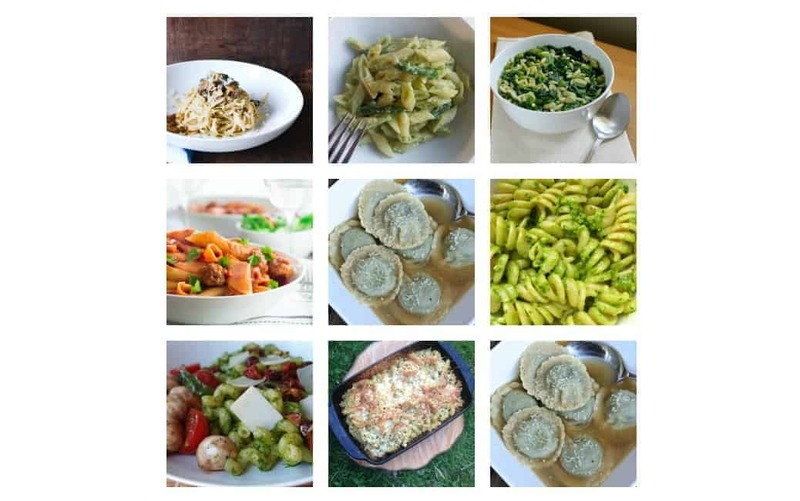 Once again, thank you to all the blogs that joined in with Pasta Please this month. If any of the recipes have whetted your appetite, do go and visit the links. This month, Pasta Please is being hosted over at Slice Off Me. Mmmmm some lovely sounding recipes here! Pasta is such a great, year round, versatile dish! I love pasta too, do enter if you get a chance! Lovely roundup. We actually had pasta last night with venison meat balls, so good!